A light and easy recipe for chicken in buttered white wine pan sauce turns ordinary chicken into an elegant and delicious dinner. Equally perfect for a regular weeknight supper or your next dinner party! Chicken, you old reliable stand-by, you. You are always here for us…on those days when we are running in a million different directions all day long, and at the end of that long day we come home to a house full of people with hungry, expectant looks on their faces, you never let us down. You are always, always reliable…but if I’m going to be totally honest, you CAN be just a teeny bit, well, boring. Unless we cook you up with an easy, elegant buttered white wine pan sauce. Then, chicken, you rock. First we are going to do what we usually do with you, which is pound you flat and saute you up quickly in a little olive oil and butter until you are nice and golden. But instead of serving you up all plain and ordinary, we are going to take another 10 minutes and cook up a lovely sauce to dress you up in. We’re going to pop some chopped shallots in that same pan that we cooked you up in and stir them up until they are all nice and tender. Then we’re going to simmer first some white wine and then some chicken broth to make a nice light sauce. And last but not least, we are going to swirl in some cold butter to give the sauce a silky, buttery texture. A few chopped herbs, some salt and pepper, and voila! Elegance. 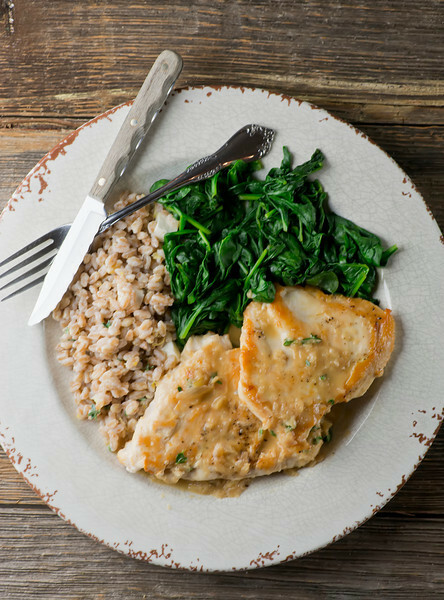 I served you up with some baby spinach and some farro with chopped mozzarella, but with your lovely, easy, scrumptious buttered white wine pan sauce, you were definitely the star of the show. Here’s a quick video to show you how happily easy it is! It’s amazing what an extra ten minutes can do! Put olive oil and butter in a large heavy saucepan and heat over medium high until butter is melted. Add chicken and cook until golden on both sides, about 3-4 minutes per side. Remove chicken and keep warm. Add shallots and saute until tender, about 2-3 minutes. Add wine and cook until it is reduced to a tablespoon or two. Add broth and simmer for 5 minutes. Add cold butter and stir until it is melted. Stir in herbs and season to taste with salt and pepper. Add chicken to the pan and turn the pieces over until they are coated with the sauce. Place chicken pieces on warmed plates, drizzle sauce on top and serve at once. 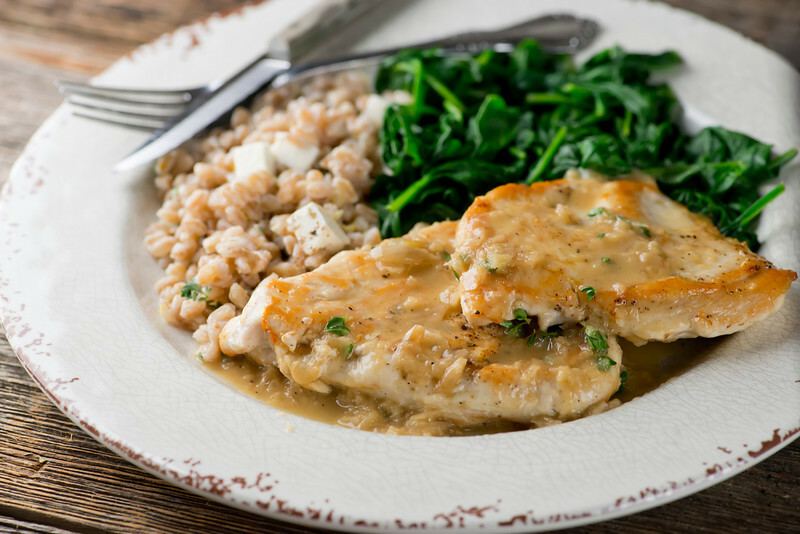 I needed a quick recipe for a butter & wine sauce for chicken and this fit the bill perfectly — simple and delicious! Definitely a keeper ???????? This was delicious and easy tasted like something you would get at a nice restaurant !thank you! can i sup dried basil instead of thyme or parsley? Thanks Laura! I love heavy cream, but I don’t like what it does to my waistline. Love your additions to this recipe! I’ve gone back to this recipe time and time again. My family loves it and it’s a definite go to- thank you! Thanks for making it seem so simple and accessible, I’ll use this to surprise my fiancee who said I can’t cook anything beyond scrambled eggs!! I’ll show her ha! Very good and tender! I used Perdue Perfect Portions which are pretty thin so I didn’t need to pound them. Didn’t have any shallots so I used finely chopped sweet onion. My husband (who normally only likes plain old chicken) LOVED it and asked me to make it again! Definitely saved this pin to my “Proven Main Dishes” board! Thank you! This was amazing! I didn’t have shallots, so I just sauteed the chicken with 1 clove of garlic and sauteed sliced crimini mushrooms before deglazing the pan with wine. I can’t wait to try again with shallots! Thank you! I was looking for a simple way to jazz up chicken. This was SO delicious! I even subbed fresh rosemary for the herbs. It went straight into the virtual recipe box. Yum! Curious to know what kind of white wine you use. I haven’t ever cooked with wine and haven’t really ever found any I liked to drink in particular. Hi Frank! I tend to use chardonnay because that’s what we have in the house – I find it is a good balance between sweet and dry. This is one of the best chicken recipe’s I’ve made. I omit the shallots and use garlic instead. I have done it with and without dredging the chicken in flour before browning – both results are delicious. Now that I’m on a KETO diet, this is perfect over Zoodles. I would make this for a fancy dinner party – it’s that good! Eric! Thank you for this lovely comment – you made my whole day! I have a recipe for pesto zucchini zoodles that you might like. :) Have a great weekend!